With the big rides of summer behind us, it’s time to start thinking about fall activities. And nowadays, when I think of fall I also think of coffeeneuring. I’ll be posting the complete 2014 Coffeeneuring Challenge rules next week, but in the meantime I thought it would be fun to look back to last year with two of the original coffeeneurs, Simon and Tara, of @whatsupwheaton. I particularly like how they included a quick assessment of the “bike friendliness” of each location. 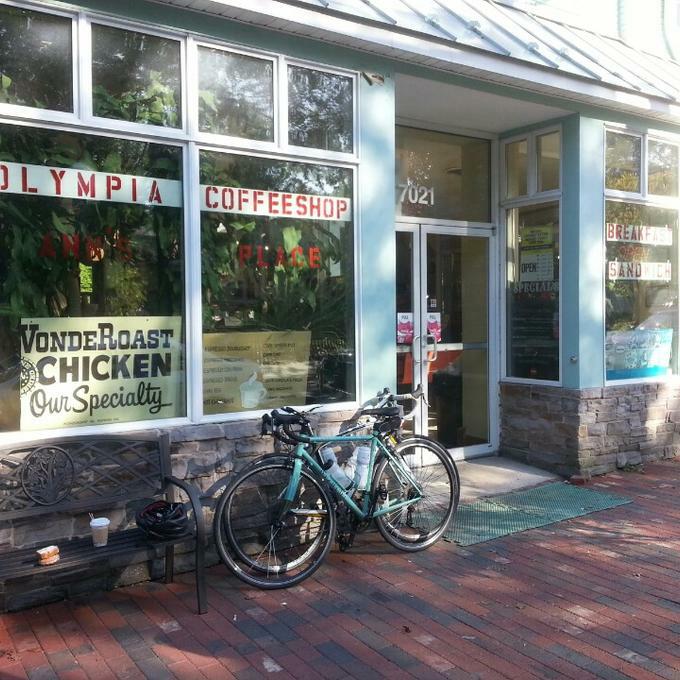 Please enjoy their Coffeeneuring Challenge summary from last year. As we’ve done since the original challenge in 2012, we’ve completed the challenge as a team, trying to find coffee shops (relatively) near us in Montgomery County, Md. Two highlights for this year’s challenge were: managing to visit five new-to-us coffee shops, as well as avoiding having to resort to a Starbucks trip altogether, which we’ve done in the past. A little bit about our ride: On a beautiful sunny fall day, this trip was a new route through the neighborhoods of Olney, on a wooded trail around Lake Bernard Frank, and into the historic town of Sandy Spring. The highlight of this bakery is definitely the pastries, and not the coffee, which was a self-serve coffee-maker, with the carafe of coffee warming on top of it, like you’d see in a gas station. Since we were there at lunchtime, we sat outside and had sandwiches with our coffee. Bike-friendliness: The bakery has two tables outside, and you can easily leave your bike leaned against a planter or the store itself. 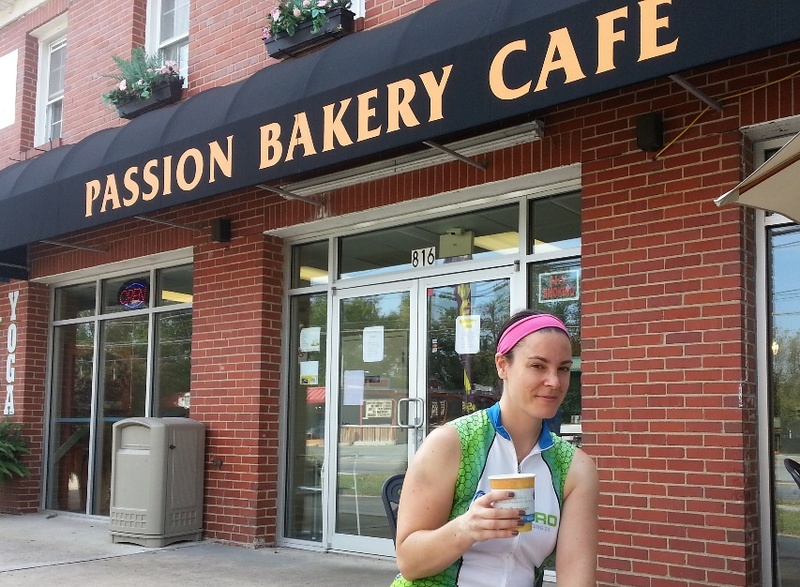 As we read in your coffeeneuring updates later that day, we weren’t the only coffeeneurs to visit Passion Bakery on that date! Where: Cremcaffe Espresso Bar, 199 E. Montgomery Ave, Rockville, Md. What we drank (and ate): Coffee and a café au lait. A little bit about our ride: This was our furlough mid-week ride. It was a cloudy and overcast day, and a very quiet ride up Beach Drive, Rock Creek Trail, following Rockville’s signed bike routes through some quiet neighborhoods and then finally into downtown Rockville. 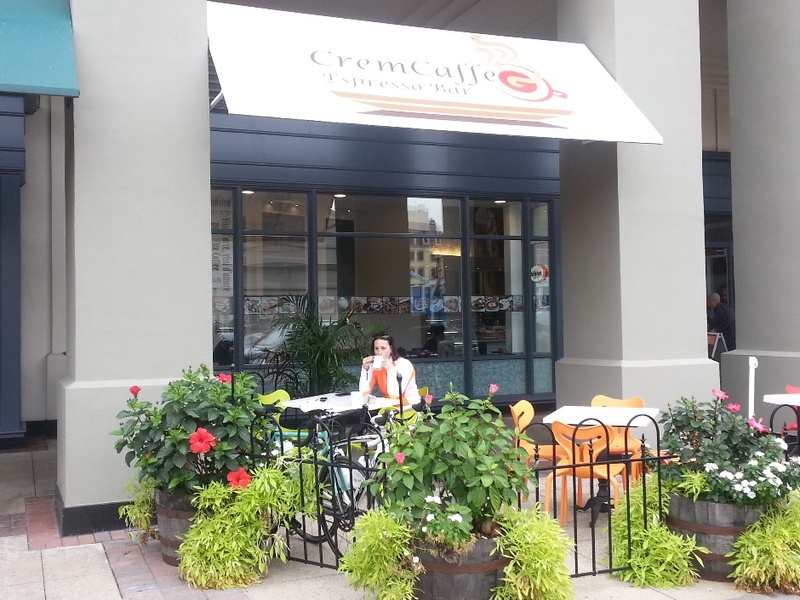 Cremcaffe serves excellent Bristot Italian coffee, which they brought out to our outdoor table. The counter featured some delicious-looking pastries, which we refrained from eating, only to resort to Honey Stinger Waffles on the way home due to coffee-induced hunger. Bike-friendliness information: No obvious bike racks, but you could probably lock up at a parking meter. 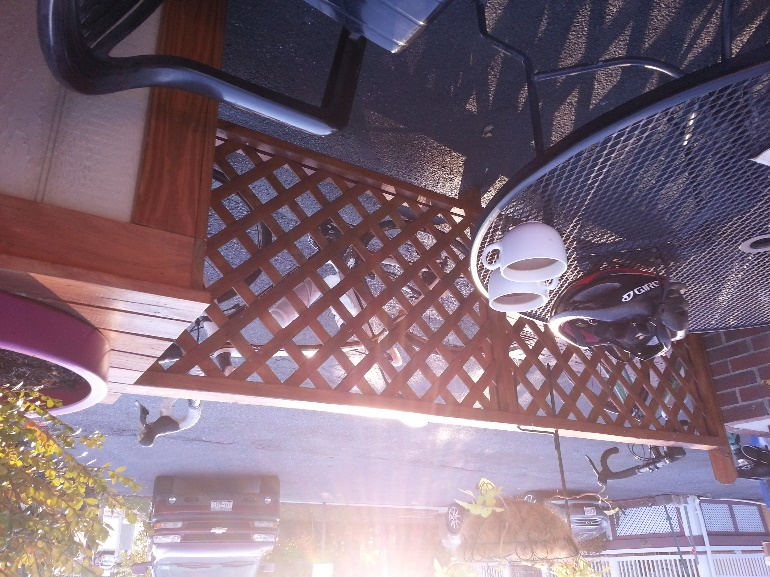 We sat outside, overlooking the parking lot, with our bikes against the shop’s railing. 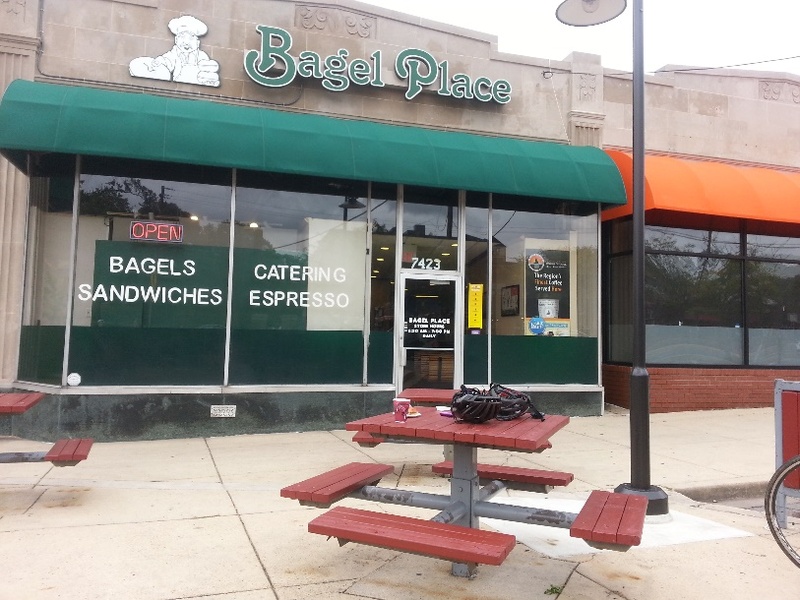 Where: The Bagel Place, 7423 Baltimore Ave, College Park, Md. What we drank (and ate): Two small drip coffees, and a cinnamon sugar bagel. A little bit about our ride: This is a fun ride from our house, as most of the ride is flat and through the woods on Sligo Creek and Northwest Branch Trails. Once we arrive in College Park, we circle around Lake Artemisia. It is inexplicable to us that College Park, home of our state’s largest university, should lack a legitimate, authentic, independent coffee shop. This bagel place seems to be the next best thing. If you arrive in late morning/early afternoon, expect to wait in line behind many college students ordering bagels! The Bagel Place offers coffee, in self-serve urns, in a variety of choices from local Chesapeake Bay Roasting Company. The coffee and bagel served to keep us warm and fortified, as we ended up getting completely soaked in a rainstorm on the way home. Bike-friendliness information: There are bike racks directly outside, as well as several outdoor tables, if you want to babysit your bike. Where: Olympia Coffee Shop, 7021 Brookeville Rd., Chevy Chase, Md. What we drank (and ate): Drip coffees, made to order, with cookies. A little bit about our ride: Naturally, we felt obligated to take advantage of the Tara Rule on Columbus Day. Just before the Maryland/DC line on Beach Drive, we took a right into a leafy neighborhood that became the Town of Martin’s Addition, and we then emerged in Chevy Chase. 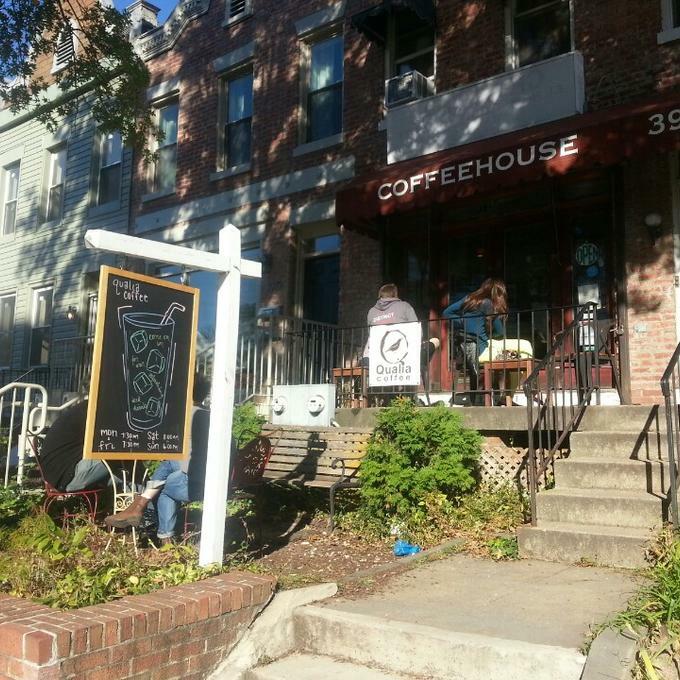 The coffee shop is in a small commercial strip on the block with a dry cleaners and a small grocery store. This is an old-school full-service diner, complete with counter stools. The prices for the diner food (omelets, burgers, etc.) looked remarkably reasonable. We ordered two drip coffees to go, and grabbed a couple of plastic-wrapped cookies. There aren’t any outdoor tables, but we took our coffee and cookies to a bench directly outside the diner. Where: Qualia Coffee, 3917 Georgia Ave, N.W., Washington, D.C.
A little bit about our ride: We got a late start this Sunday afternoon. We rode down Sligo Creek Parkway, cut across to Takoma Park, and then rode down city streets on bike lanes. Once at Qualia, we sat on the front porch with our coffees, overlooking Georgia Avenue. We missed the back patio, which apparently is much nicer. One thing we learned from this trip was that, if you get to a coffee shop late in the day, you should probably order an espresso drink, rather than relying upon whatever drip coffee may have been sitting around for hours. As much as we’d heard good things about Qualia’s coffee, what we had didn’t live up to expectations. We went back via Rock Creek Parkway and Beach Drive. Our rides ended in different places because, about three miles from home, Tara got a flat rear tire and decided to sit and wait for Simon to go home and pick her and the bike up with the car. Bike-friendliness: Qualia touts its bike-friendliness on its website. There are bike racks in both the front and rear of the shop. Where: La Mano Coffee Bar, 304 Carroll St, Takoma Park, Md. What we drank (and ate): Americano and a green tea, as well as an apple hand pie. A little bit about our ride: Another beautiful sunny day with lovely foliage along Sligo Creek Parkway and the city of Takoma Park. We had houseguests that day, so we didn’t want to wander too far on our coffeeneuring adventure. La Mano is the newest coffee place in Takoma Park. They had just run out of drip coffee when we arrived shortly after noon, so we ordered an Americano and a green tea, instead. Both were really delicious! 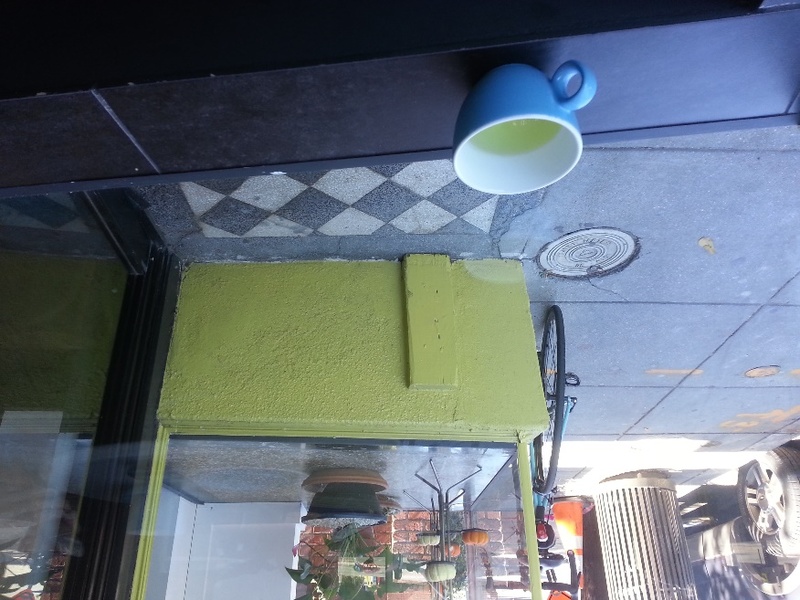 The coffee shop is in a tiny storefront, but, judging from the foot traffic and the banter between staff and folks who must be quickly becoming regulars, it seems to be doing really well. Bike-friendliness: Directly across the street is the Takoma Park metro, where there are plenty of bike racks. If you didn’t bring a lock, the narrow sidewalk makes the situation less than ideal. We leaned our bikes against the front windows and kept an eye on them from an inside table. What we drank (and ate): A drip coffee and a Mighty Leaf green tea. A little bit about our ride: This began as a quick ride, but with head winds and general fatigue, it was pretty slow-going. The coffee is always good, and is served in mugs if you ask. The shop always seems to be full of people chatting, studying, and reading. Bike friendliness: Very bike friendly. Staff and customers bike to the café and leave their bikes in a small bike rack near the front entrance. There’s also a large seating area in front, with umbrella-ed tables, where you can also lean your bikes against a low wall. Well done, Tara and Simon, and I hope you return to coffeeneur again this year! I’m sorry your experience at Qualia was disappointing. Yes, the house coffee does sit around, sometime longer than it should if we are distracted by the necessity of making custom drinks. But, of course, the point of having house coffee is so that it is ready for people who just want a quick cup of coffee. From your post, it’s not clear why you chose that option over the selection of a dozen single origin coffees, all roasted within one week and available brewed to order. That is our specialty, highlighting the wide variety of single origin coffees we roast in house. Although, we are also the only coffee shop in the area with a Slayer espresso machine, which makes for some pretty amazing espresso-based drinks.